We have received many reactions to how our music works on animals, everything from a schaefer that add ears to the speakers, chatty budgies suddenly becomes quiet and a dog brought blankets from different places in the house and leave the front speakers. 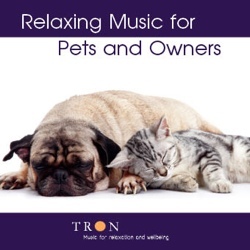 In collaboration with a norwegian animal interpreter Center we have picked out the 70 minutes of the most relaxing music suitable for animals. And it seems there is no doubt. One of our customers report that she puts on music every time she goes out and her dogs are home alone. This is a collection-CD with music selected from TRON Syversen's music CDs. You can find tracks from Whispers of Assisi, Gentle Moments og Inner Balance og 3 pieces from Sacred Dreams (former 10 Lullabies). More than one hour of relaxing music from some of Tron Syversen's releases (Sacred Dreams, Whispers of Assisi and Inner Balance. Put it on repeat when you leave your animals alone. This is also a superb meditation CD with 2 long tracks, one of them more than 20 minutes.